When it comes to getting noticed online, paid advertising such as PPC – Pay Per Click – is an option that many companies and SEO agenices choose to go down. However, just because a direct financial cost is involved doesn’t mean companies have carte blanche freedom to do as they please. Case in point: Google’s latest Bad Ad Report. 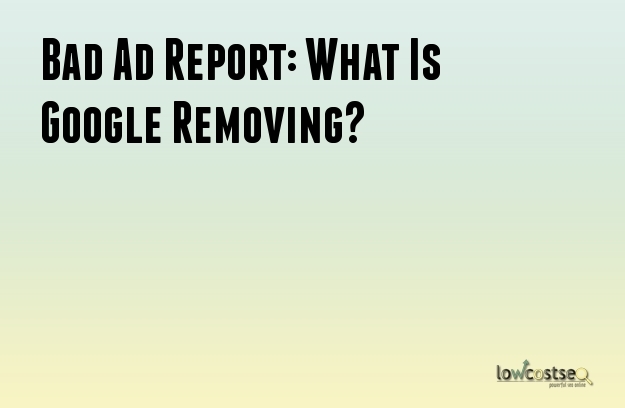 This document shows that 1.7 billion ads were removed in 2016, compared to 780 million in 2015. At a glance, this tells us two things: either Google is getting more strict with its advertising system, or there is a growing number of ‘spam’ advertising. The truth, most likely, is somewhere between these two points. The best way to look at this – and to ensure your own practices agree with Google’s current point of view – is to look at what type of ads are being removed. The “trick to click” term has been around for sometime now and refers to adverts that look like error reports or system warnings, hoping that users will panic and click on them. This often leads to malicious software and other issues: certainly, users aren’t getting the content the advert suggested. How popular is this? Google’s systems stopped 112 million “trick to click” adverts in 2016, which they say is more than 6 times the number found in 2015. Of course, if you’re adverts are true, honest and relevant with their wording, this isn’t a problem. This is usually a tactic devised by scammers. In the latter half of last year, there was a lot of emphasis to remove fake ads and stories. These pages are often click-bait, tempting users with a strong headline and a relevant photograph to mimic real news. The problem, of course, is that these pages have no value and, of course, offer incorrect information – if Google started taking these into its queries, users would become unsatisfied with the false answers presented. There are, of course, a few exceptions to every rule. Satirical websites obviously have their own value, but trying to separate this from typical searching is no easy feat. Right now, it’s best to stay true and honest. Last summer, Google launched an initiative to cut down on payday loan adverts. Specifically, any that now remain have to meet certain criteria. They cannot have an APR above a certain rate (36%, in the case of the US), have to short a turn-around for payment (60 days or less and Google won’t run the advert) and display all other relevant information clearly. This is a lot to do in the small space PPC offers, but it’s vital to do. Of course, other companies don’t need to worry about this but it is something to keep in mind. Could further changes apply to general loan companies, bank adverts and anything financially related? Google’s report is much more extensive than this, but these are the main takeaways. Alongside this, it also removes misleading adverts and ads for illegal products. So, what should you do? Ultimately, nothing has really changed. As long as you’re honest and relevant to the queries (using the right keywords) Google shouldn’t have a problem with your adverts – and neither will users who click through them.